Restaurant chain introduces seven all-natural burgers. Ihop, which stands for International House of Pancaks, said on social media last week that it’s changing its name to Ihob, causing more than 30,000 fans to guess what the "b" would mean. Today, the restaurant chain unveiled the answer: burgers. While guesses ranged from bacon and biscuit to bananas and bitcoin, Ihop – or Ihob now – decided to flip its "p" upside to debut its seven new all-natural Ultimate Steakburgers. The burgers are available nationwide today, and Ihop will remain Ihob for the time-being, including at its flagship restaurant in Hollywood, California and on Twitter. Ihob worked with Droga5 on the creative for the campaign, which showcases an enthusiastic restaurant manager on top of the chain’s iconic (and steep) blue roof to shout out the news to everyone around. The spot will air on national TV, as well as online and social media. 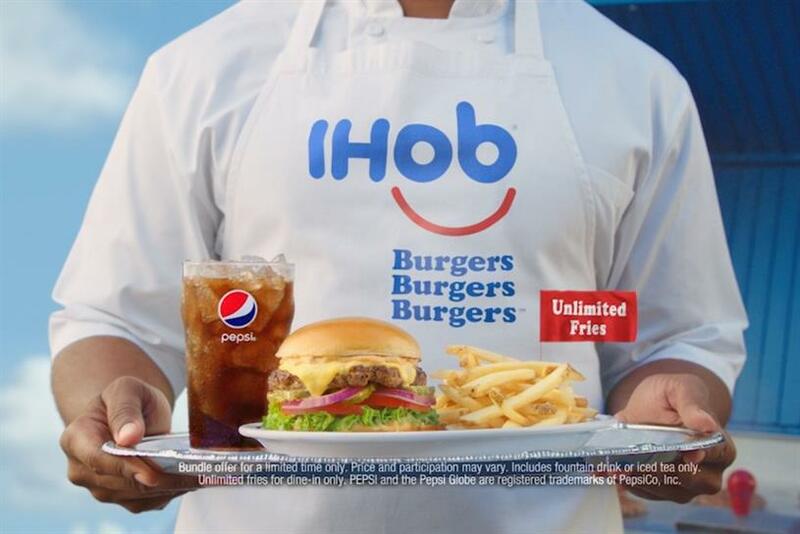 "Everyone knows that Ihop makes world-famous pancakes so we felt like the best way to convince them that we are as serious about our new line of Ultimate Steakburgers as we are about our pancakes, was to change our name to Ihob," said Brad Haley, CMO of Ihob, in a statement. The Ihob social stunt comes shortly after Denny’s worked with its agency EP + Co to "accidentally" send out a working draft of a press release, complete with tracked changes, to promote its $5.99 Super Slam value meal. PRWeek’s Steve Barrett suggested in his weekly column on Friday that this could be a signal of there still being mileage in attracting attention through good old stunts.